Total Reading Time: 10 minutes. Are you just the latest social media app, or a pioneering multi-billion dollar platform at the forefront of digital media capturing consumer attention that’s destined for the long haul? A lot of people say it’s the latter. Solopreneurship is exploding, and for the right influencer, brand, or company — Snapchat is the single most effective and engaging way to connect with a new or existing audience. 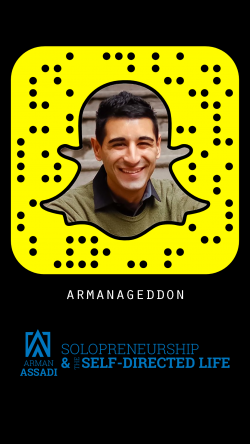 After some careful consideration and thinking through a list of ingredients every business needs, I decided to go “all in” on Snapchat and have been building my account while also connecting with other Snapchatters. 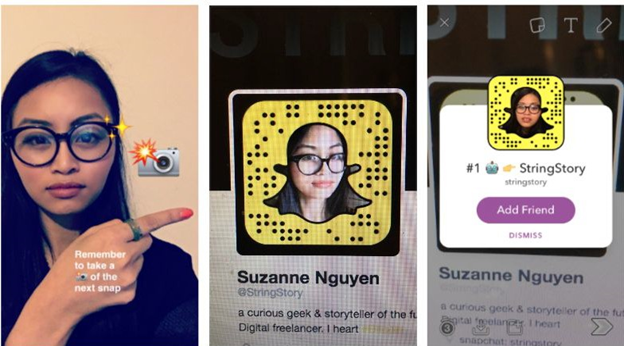 One of those influencers is my friend Suzanne Nguyen, known as String Story on social media. Suzanne is a “curious geek of the future that loves fried chicken, tech, and communication”. 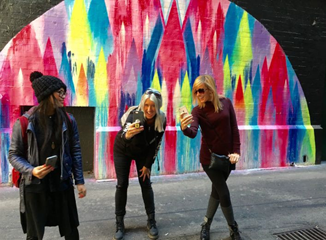 She’s also one of the most popular influencers teaching Snapchat marketing tactics. I performed a “takeover” on her account utilizing the exact strategies she teaches (strategies that she’ll be breaking down in detail in this post). You can see the actual video from the takeover below. What is a takeover you ask? Definition of a Snapchat Takeover: A Snapchat takeover is when a person/brand allows another user to log in and share content to the account’s public story. Open Snapchat and take a photo of these Snapcodes OR click the image to automagically add. Many have complained that Snapchat, as a closed network, is a hard channel to grow an audience. Whilst this is true, it took me just 3 months before I hit the 1k mark. Now, I realized from all the takeovers I’ve done, that it’s a hard number to reach for most people. 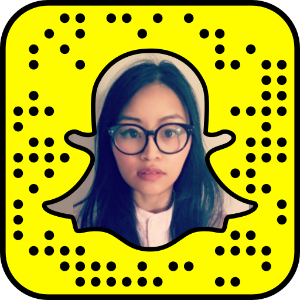 I’m super-excited to work and collaborate with you on helping YOU make the most of Snapchat Takeovers! My role here is to act like a Producer and help you provide value to your audience. To date, I’ve successfully completed 15 takeovers (and counting!). My results so far? They’ve been overwhelmingly positive. 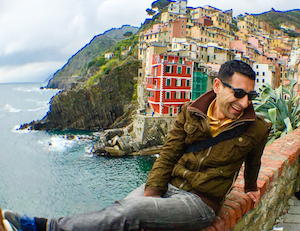 Sit back, and read my own notes and thoughts on how to produce awesome Snapchat Takeovers! Hint: It’s never about you. Even though it’s your channel, it’s never about you, it’s about the audience and the value you provide them. To help figure out your target audience and audit your numbers before you approach others for potential takeovers, click below. Geeks, startup, tech entrepreneurs and creative entrepreneurs. Mostly men, between the age of 25-50. Australia and the United States, mainly. So far, they do enjoy takeovers because they get to discover new Snapchat Users and Content Creators. 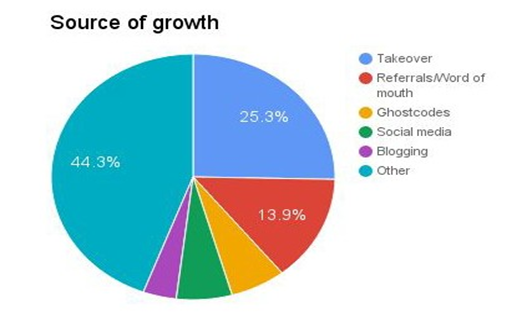 From the pie chart below, I was able to reach a snap view of 1000 by having regular takeovers, 23.8% have been from takeovers, which is why it’s important to use this tactic as a way for others to discover you and follow you on your Snapchat account. Refer to Worksheet 10a (page 15) to gauge and audit you SnapChat channel. Avg 30 comments (#TechTuesday), it once peaked up to 87 comments. My Followers are trained to be personally­ engaging, now they understand the concept of screenshots. They now also incorporate screenshots in their stories to help drive user engagement. 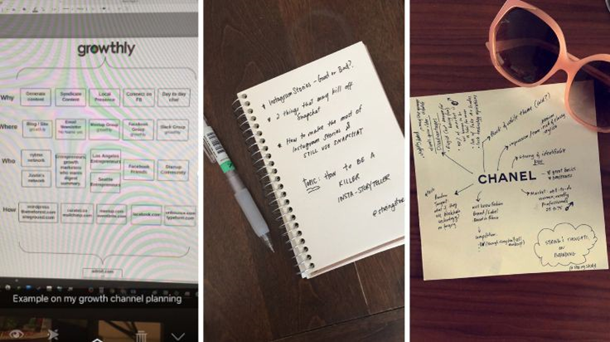 My audience tends to want and respond better to visuals such as flow charts, lists, and schedules. For example, when Arman Assadi (@armangeddon) jumped on, his slides and giveaway images were screenshot hundreds of times. Lately, my mind maps and flow charts (refer to image below) have been getting the most amount of screenshots. 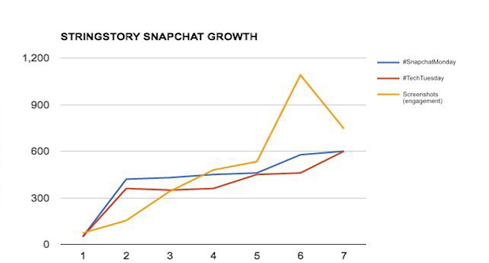 From experience, to create 1.5 ­- 2mins of quality Snapchat content, it takes approx. 1 hour of your real time. NB: Snapchat is not a YouTube channel: it’s best to treat with brevity ­- use a “keep it short and sweet” attitude. Being succinct is key. I suggest that you have the same editor type attitude too, again you like to ensure takeovers to provide value to your audience. Keep the handover process simple. But, if you’re scared someone will steal your account, here are some ways to protect it. Ah, the Big One! Most people are scared of someone hacking and stealing your passwords. Understandable. BUT, we have a really cool system that’s baked ­right into Snapchat. We’re going to talk about 2FA -­ or, “Two Factor Authentication”. On Snapchat it’s called Text Verification. Change your password into a temporary one. Swap Snapcodes & pre­introduce the Snapchatter beforehand. Tap the ghost icon at the top of your Camera screen. Tap the Settings gear in the top right-hand corner of your Profile screen. Tap ‘Login verification’ under the ‘My Account’ section. Enter the verification code sent to your mobile phone and tap ‘Continue’. Every time you swap accounts, make sure you are on standby and exchange the second text verification codes. Promote the Snapchat takeover on your social channels. Share the news about the takeover on your various social channels. Yup, I’m looking at you Twitter, Facebook ­ and even pre­introduction on your Snapchat channel. 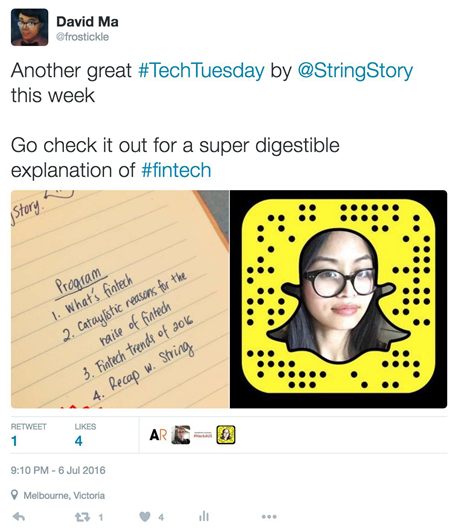 Leading up to your takeover, you can let people know that you’ll be on the @stringstory Snapchat channel. It’s also a good idea to tweet it out and share on Facebook during your takeover. Engagement during your takeover has a noticeable increase when you do this kind of cross-platform promotion. Give them your Snapchat GhostCode! Providing feedback to other Snapchatters on Twitter, and having them do the same for you is a great way to cross-pollinate your audiences. Private replies on Snapchat increase your engagement with only one person at a time. Provide value. “All winners, no fillers!” Make each snap count. Avoid follow-my-day types, you can watch this on any other Snapchatter account. The goal is to encourage the audience to follow you on your own Snapchat. Remember you’re a guest on someone’s channel. Be yourself, but respect their differing audience demographic and culture. Yes, people are known to tap away, so add text captions. Do a pre-introduction on your own Snapchat account, introducing the Snapchatter. Save your ‘stories’ before handing over the accounts back to the original owner. Give tips people can use right now. My general theory with content creation is that every 3 minutes a person should walk away thinking they learned at least 1 new thing, so that would definitely apply to takeovers. 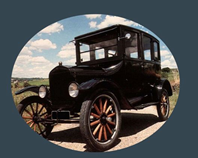 Give the people a reason right now to follow you back, like continuing the tips on your page. So in one takeover I have 5 tips for motivation and the 5th one was on my story, so they needed to follow me to get that tip. The Praise – Thank them (audience/channel/host) for their attention and the opportunity to meet. “See you back over on my channel”. Know who your audience is and WHAT they are interested in. Be organized, plan your story deliberately so it flows sensibly. Keep it crisp – make 3 to 5 major HI IMPACT points. “HI IMPACT” means “substantive, meaningful and appropriate content” which the audience would greatly benefit from. Have a strong intro which clearly explains who this new face is and why they’re there. Use the caption on each snap to summarize the point of that snap, this makes the entire story much easier to skim through, resulting in more viewers making it to the end. Viewers who skim quickly to the end are more satisfied than viewers who drop out halfway because they couldn’t follow the story. Satisfied viewers come back for more and follow takeover-ees. Provide value by curating high impact content with a format. In TV production, reality and game shows have a preset structure called a “format”. I’ve found that having a format and sharing the program encourages your viewers to tune in or allow them to opt out. Refer to Worksheet 10c and 10d (page 17 and 18) to help format your Takeovers. Feel free to send the worksheet to your collaborative Snapchatter, who will be taking over your account. 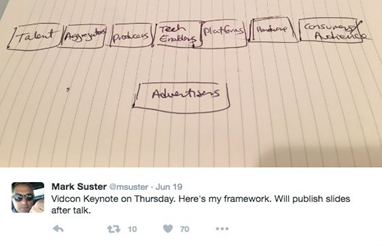 Mark Suster (@msuster) is a good example, he shows the program of the week/day. *NB. Personally, I have found this to be least engaging takeover style, so try to avoid if possible. This concept can be used to do collaborative takeovers for Instagram Stories too. On Snapchat, you hand over your password to the collaborator to access the account. 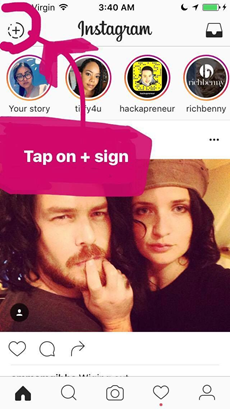 While on Instagram Stories, the host receives multiple videos or stills from the collaborator. 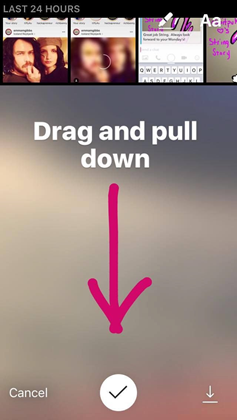 Snapchat has the white borders and Instagram Stories has none, making it a more seamless experience. Essentially, Instagram allows you to upload strings of content from the last 24 hours in your camera roll. Again, takeovers can be used as a backdoor access to a new audience and demographic. 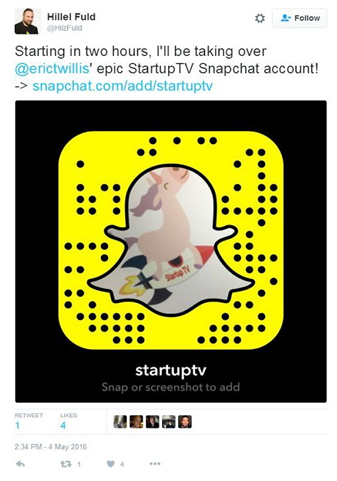 Within 8 months, I consistently treated Snapchat like my own TV channel that I’ve gained business and connections. This post about takeovers is just one of many Snapchat tactics I cultivated. I share all my thoughts and tactics, including how to grow your channel at my Snapchat Marketing Accelerator. This course will suit anyone who wants to leverage video to build up their brand, confidence, and personality. How will you use Snapchat going forward — and if you haven’t yet — what questions do you have?